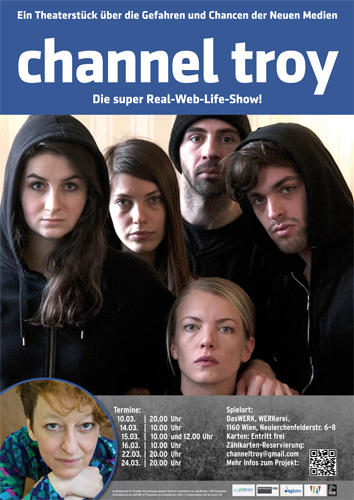 The 4 chatters JUDITH, NAEMI, PATRICK and FLORIAN have applied themselves at the TV broadcasted real-life-web-show „Channel Troy“ as chatter-candidates who can win a special price by being voted (counting „likes“) by the audience (before the performance is starting, there will be handed out 2 signs for voting to each spectator: the facebook symbols ,like‘ and ,dislike‘). The candidates have been chosen out of an enormous amount of applicants via a chat-roulette system. They login and create their own internet profiles including nicknames referring to the mythology of Troy (Andromache, Penthesilea, Heleno, Hektor). Whilst they‘re fighting for „likes“ within their chat-dialogues, each of them is invited to the life-show. There Ruth is taking interviews with them to let the audience find out what the real person behind their chat identity might be. Our characters are involved in a game of beeing personal and fighting to be a winner at the same time, which makes the tv genre, they are in, to be their personal crucial test. There will be different ways of dealing with it untill the studio invites Hektor/Florian, who uncovers the tv-formate as a user, who uses it himself. After this, Penthesilea/Naemi fights for rights by taking someone hostage out of the audience to the chatroom. This action rises up a contreverse discussion among the chat-members and we will see, what they will win or loose when they enter the studio all together the first time to get into „real“ contact with the audience.